A cook brought in traffic in Alabama. An ad featuring an injured roofer helped in Mississippi. Bloomberg) — More than 1 million people waited until the last five days to sign up for individual “qualified health plan” (QHP) coverage through the new public exchange system. Early indications are that many Patient Protection and Affordable Care Act (PPACA) plan procrastinators were young, insurance analysts and enrollment groups said. That may be good news for health insurers. Insurers have been conceerned about signs that the early PPACA exchange “qualified health plan” (QHP) enrollees were older and sicker than expected. 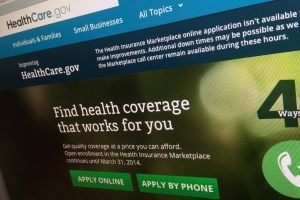 The official PPACA individual QHP open enrollment period started Oct. 1 in most of the country and officially ended in most of the country Monday. Insurance companies hope the last-minute volume brought in younger and healthier customers, according to Robert Zirkelbach, a spokesman for America’s Health Insurance Plans. QHP watchers expect the U.S. Department of Health and Human Services (HHS) to release at least some QHP enrollee demographic information later this month. Groups working on enrollment provided anecdotal evidence that the latecomers were younger than than the consumers who signed up earlier. In Alabama, Daniel Liss, the co-founder of Bama Covered, which coordinated student volunteers to promote enrollment, said many of the initial applicants in his state were women. Latecomers tended to be male and young. There was a similar dynamic in Mississippi, said Roy Mitchell, executive director of the Mississippi Health Advocacy Program in Jackson. Mitchell said a combination of word-of-mouth publicity and a television advertisement featuring an injured — and previously uninsurable – roofer began to draw men. In Forth Worth, Texas, volunteers at the United Way of Tarrant County saw more Hispanics coming in as the deadline neared, said Tim McKinney, the organization’s president. The number of people seeking help enrolling got so heavy in the final weeks the group had to stop allowing walk-ins and required everyone to make an appointment, he said. Unlike other organizations, though, McKinney said the United Way hasn’t seen a shift toward younger enrollees. Most of those signing up in the final days have been over 45, he said. –With assistance from Margaret Newkirk in Atlanta.